All About the Outfit: Man, I have wanted this skirt for almost a year! 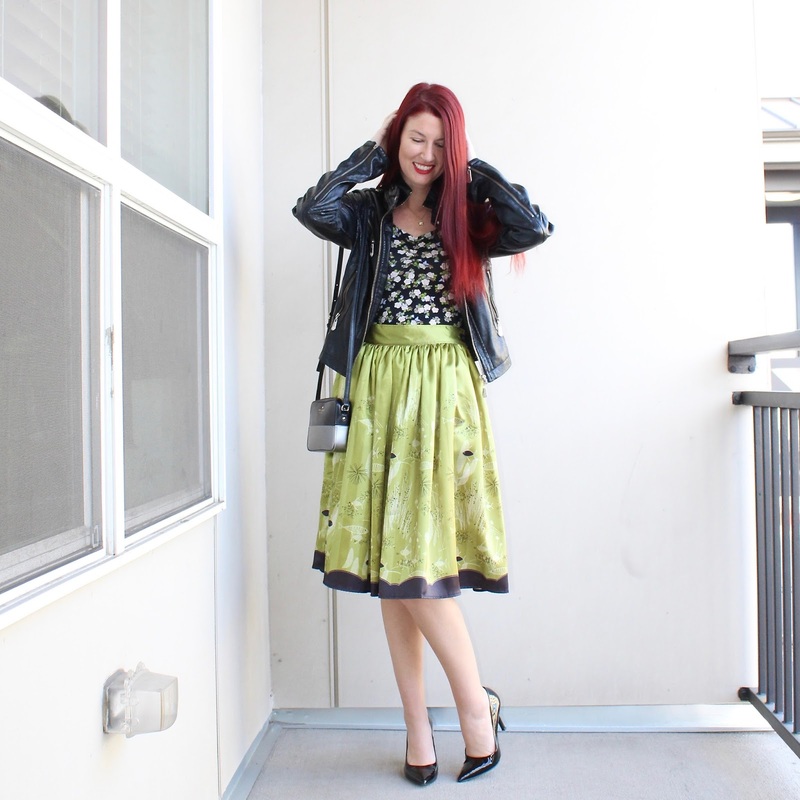 Denielle Von Fitch, designer/owner of The Oblong Box Shop, designed this skirt after vintage wall paper. Talk about a vintage novelty print lover's dream! 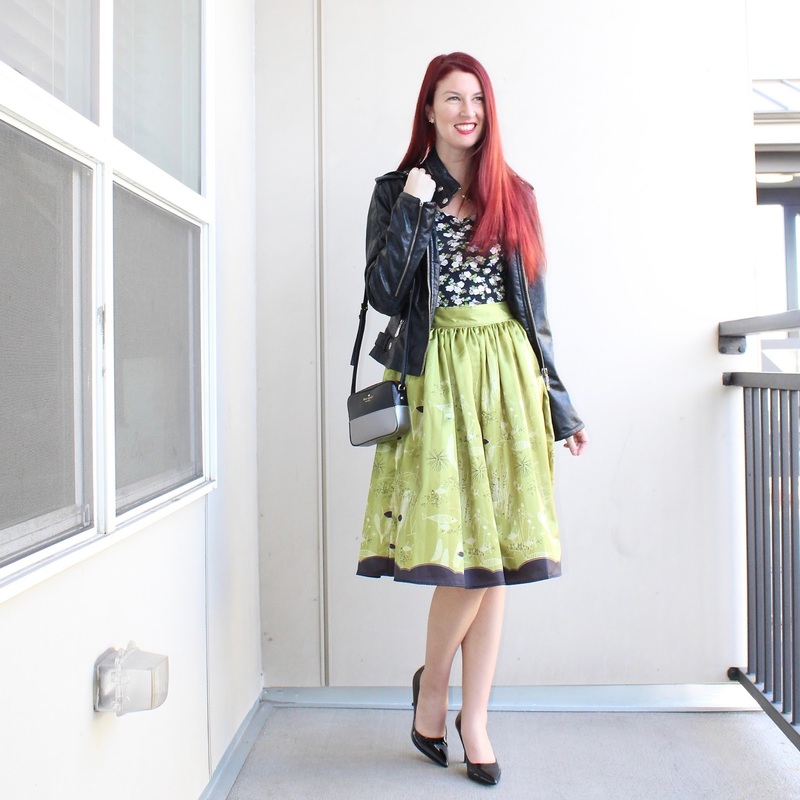 What held me back is that the skirt is satin, which isn't really my go-to fabric. I've discussed this with other women who dress similar to me, so I can say that I'm in good company when I express that despite liking to dress up pretty much daily I try not to look "too fancy." Cotton dresses and skirts are a-ok in my book. Something about the silkier fabrics put it over the line and makes me feel over-dressed for everyday life, so they don't get as much wear. Von Fitch had a few to die for prints in the satin fabrics and I finally bit the bullet two weeks ago when she put this on a temporary sale to help clear older styles. My thoughts? I like it! It's not as bold or over the top as I feared it could been regards to the fabric. You can barely tell it's shiny in person, compared to similar skirts I own for other companies (phew). That said...it runs large. I don't know if it's the line, the fabric, a fluke, or what but it's pretty big on me. I can't seem to find my measuring tape to figure out if it is bigger than other TOBS skirts in a small or if it's me (I'm still tinier than I was this time last year but I don't think it's me as I've worn my other TOBS skirts recently and they fit normally...), but regardless I cinched it with a chip clip in the back so it didn't look crazy on camera. I'm currently pondering how to shrink this or to get it altered or what...because it really is a dream skirt! Either or, I'm not entirely sure these satin skirts are returning! All the ones Von Fitch made last year were put on sale and I have yet to spot any new ones coming out in the photos of new 2017 designs she's been teasing us with on social media. My final verdict is that I LOVE this skirt, but like the other fabrics better. So I'd have to REALLY love a print to get another one in this fabric, but I'm definitely keeping and loving this one! Style Details: I mixed prints with an H&M body con dress from several years ago and used it as a top. I rounded out the rest of the outfit with my some of my favorite staples: a leather jacket from TJ Maxx, purse from Kate Spade, and Nine West pumps. This skirt is still for sale, though it is not currently on sale. I do believe once it's out of stock it's not coming back because the store alluded to that happening to this skirt and several other amazing original styles, so definitely think long and hard before passing!! How was everyone's weekend? Mine was busy with the usual: comedy projects and allergies, ha. At least the weather is mostly nice these days! Anyone else foaming at the mouth from all of the spring releases happening from most stores? I know I am...!